A list of recordings consulted for my series of articles The Lute. This is a work in progress, and I will be adding to it regularly through the process of developing the series. Many of these recordings include detailed and illuminating liner notes as well, and most of the recordings on this list I think highly of. 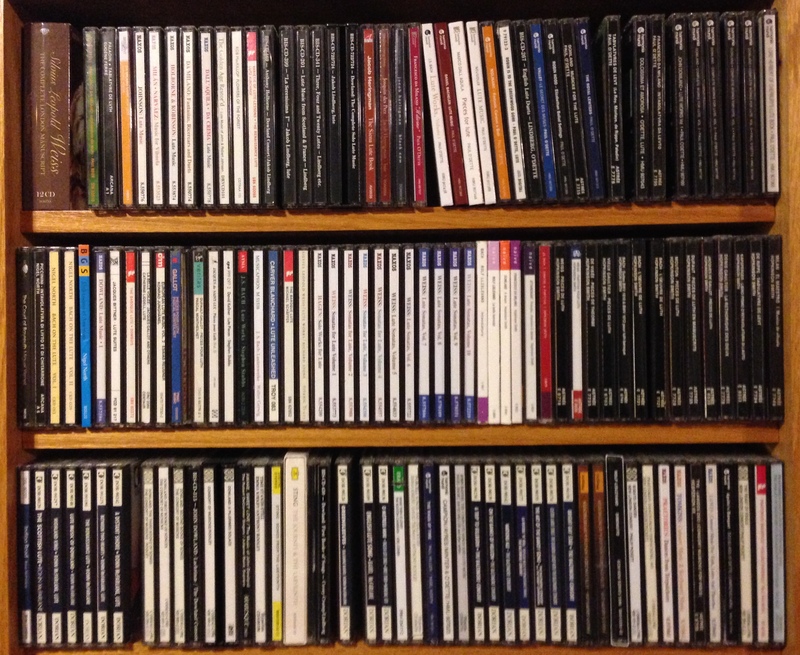 All of these recordings are on compact disc, and all are DDD unless otherwise noted. In most cases, for recordings with two or more dates, the first date(s) indicates the year(s) of the initial analog recording(s) and the last date indicates its subsequent digital remastering. Some discs are listed in more than one category. Barto, Robert, 1997. Sylvius Leopold Weiss: Sonatas for Lute Volume 1. Naxos 8.553773. Barto, Robert, 1999. Silvius Leopold Weiss: Sonatas for Lute Volume 2. Naxos 8.553988. Barto, Robert, 1999. Joachim Bernhard Hagen: Solo Works for Lute. Naxos 8.554200. Barto, Robert, 1999. Sylvius Leopold Weiss: Sonatas for Lute Volume 3. Naxos 8.554350. Barto, Robert, 2001. Sylvius Leopold Weiss: Sonatas for Lute Volume 4. Naxos 8.554557. Barto, Robert, 2002. Sylvius Leopold Weiss: Sonatas for Lute Volume 5. Naxos 8.554833. Barto, Robert, 2005. Silvius Leopold Weiss: Sonatas for Lute Volume 6. Naxos 8.555722. Barto, Robert, 2006. Silvius Leopold Weiss: Sonatas for Lute Volume 7. Naxos 8.557806. Barto, Robert, 2007. Silvius Leopold Weiss: Sonatas for Lute Volume 8. Naxos 8.570109. Barto, Robert, 2008. Silvius Leopold Weiss: Sonatas for Lute Volume 9. Naxos 8.570551. Barto, Robert, 2010. Silvius Leopold Weiss: Sonatas for Lute Volume 10. Naxos 8.572219. Barto, Robert, 2011/2012. Silvius Leopold Weiss: Sonatas for Lute Volume 11. Naxos 8.572680. Beier, Paul, 1997. Francesco da Milano: Intabolatura da Leuto. Stradavarius STR 33515. Bream, Julian, lute; poetry recited by Dame Peggy Ashcroft, 1988. Two Loves: A Sequence of Poetry and Music by William Shakespeare and John Dowland. (Julian Bream Edition Volume 17). RCA Victor/BMG Classics RCA 61600. Cherici, Paolo, lute and vihuela, 2014. Vincenzo Capirola: Opere per liuto / Lute Works, 1517. Tactus TC 470301. Duncomb, Jadran, 2018. Weiss & Hasse: Lute Sonatas. Audax ADX13713. Eglhuber, Christoph, lute, 2018. Hans Brüderl, lute; Theona Gurba-Chkheide, baroque violin; Angelika Fichter, baroque violin; Sabina Lehrmann, baroque cello. Solo per la Gallichone: The Lute Music of Placidus von Camerloher. Oehms Classics OC 1894. Fentross, Mike, 2018. To Dowland or not to Dowland. Zefir Records ZEF 9658. Ferré, Eugène, 1993. Iean-Pavle Paladin: Tabltvre de Lvth. Arcana A 1. Heringman, Jacob, 1999. Black Cow: Lute Music by Valentin Bakfark and Matthäus Waissel. Discipline Global Mobile DGM9906. Heringman, Jacob, 2000. Josquin des Prez. Discipline Global Mobile DGM0006. Heringman, Jacob, 2002. Jane Pickeringe’s Lute Book. Avie AV0002. Heringman, Jacob, 2004. The Siena Lute Book. Avie AV0036. Hofstötter, Bernhard, 2015. The Baroque Lute in Vienna. Brilliant Classics 95087. Imamura, Yasunori, 2006. Silvius Leopold Weiss: Lute Sonatas Vol. 1. Claves Records (no catalog number). Imamura, Yasunori, 2008. Silvius Leopold Weiss: Lute Sonatas Vol. 2. Claves Records LC 3369. Junghänel, Conrad, 1992. European Lute Music Vol.2: Lute Suites by Esaias Reusner. Harmonia Mundi 05472-77230-2. Liddell, Catherine, 1997. La belle voilée: 17th Century French Lute Music by Jacques Gallot and others. Centaur Records CRC 2359. Lindberg, Jakob, 1982/3/7. Lute Music from Scotland and France. BIS-CD-201. Lindberg, Jakob, 1989. “La Serenissima I”: Lute Music in Venice 1500-1550. BIS-CD-399. Lislevand, Rolf, 2000. Bach: Intavolatura. Naïve E 8807. Lislevand, Rolf, 2003. La Belle Homicide: Manuscrit Barbe. Naïve E 8880. MacKillop, Rob, 1998. Flowers of the Forest: Scottish traditional music for lute, mandour, cittern, guittar. Greentrax Recordings Limited CDTrax 155. McCartney, Alex, 2014. Mesangeau’s Experiments. Veterum Musica VM014. McCartney, Alex, 2015. Elizabeth’s Lutes. Veterum Musica VM015. McCartney, Alex, 2016. Toccata: Touched. Veterum Musica VM016. McCartney, Alex, 2018. Weiss in Nostalgia. Veterum Musica VM019. McFarlane, Ronn, 1990. The Scottish Lute. Dorian DOR-90129. McFarlane, Ronn, 1994. The Renaissance Lute. Dorian DOR-90186. McFarlane, Ronn, 1996. Between two Hearts: Renaissance Dances for Lute. Dorian DOR-90225. McFarlane, Ronn, 1996. A Distant Shore: Music of Bach, Weiss and Kellner. Dorian DOR-90242. McFarlane, Ronn, 1999. Highland King: The Scottish Lute, Vol. II. Dorian DOR-90257. McFarlane, Ronn, 2018. The Celtic Lute. Sono Luminus DSL-92225. Monteilhet, Pascal, 1993/1994. François Dufault/Jacques Gallot: Pièces pour luth. Virgin Veritas 7243 5 61776 2 8. Monteilhet, Pascal, 1994. Jacques Gallot: Pièces pour Luth. Fnac Music Production 592053. Narvey, Benjamin, 2017. Psyché: The French Weiss. Gamut Music GM03. Nastrucci, Ugo, 2019. Molinaro: Danze e Fantasie da Intavolatura di Liuto Libro I. Brilliant Classics 95401. North, Nigel, 1985. Bach Lute Music. Musical Heritage Society MHS 11106T. North, Nigel, 1994. Alessandro Piccinini: Intavolatvra di Livto et di Chitarrone. Arcana A 6. North, Nigel, 1994. Bach on the Lute Volume One. Linn Records CKD 013. North, Nigel, 1994. Bach on the Lute Volume Two. Linn Records CKD 029. North, Nigel, 1996. Bach on the Lute Volume Three. Linn Records CKD 049. North, Nigel, 1996. Bach on the Lute Volume Four. Linn Records CKD 055. North, Nigel, 1999. A Varietie of Lute Lessons. Linn Records CKD 097. North, Nigel, 2014. Dolcissima et Amorosa: The lute music of il Divino Francesco Canova da Milano (1497-1543), Vol. 1. BGS Records T 0845 034 0773. O’Dette, Paul, 1986. Intabolatvra da levto del Divino Francesco da Milano. Astrée-Auvidis E 7705. O’Dette, Paul, 1987. Robin is to the Greenwood Gone. Elektra Nonesuch 79123-2. O’Dette, Paul, 1992. Lord Herbert of Cherbury’s Lute Book. Harmonia Mundi HMU 907068. O’Dette, Paul, 1994. Dolcissima et Amorosa: Early Italian Renaissance Lute Music. Harmonia Mundi HMU 907043. O’Dette, Paul, 1996. John Dowland: Complete Lute Works, Vol. 2. Harmonia Mundi HMU 907161. O’Dette, Paul, 1996. John Dowland: Complete Lute Works, Vol. 3. Harmonia Mundi HMU 907162. O’Dette, Paul, 1996. John Dowland: Complete Lute Works, Vol. 4. Harmonia Mundi HMU 907163. O’Dette, Paul, 1997. John Dowland: Complete Lute Works, Vol. 5. Harmonia Mundi HMU 907164. O’Dette, Paul, 1999. Alla Venetiana: Early 16th Century Venetian Lute Music. Harmonia Mundi HMU 907215. O’Dette, Paul, 2001. Simone Molinaro: Fantasie, Canzoni e Balli. Harmonia Mundi HMU 907295. O’Dette, Paul, 2001. Robin Hood: Elizabethan Ballad Settings. Harmonia Mundi HMU 907625. O’Dette, Paul, 2002. The Royal Lewters: Music of Henry VIII and Elizabeth I’s favourite lutenists. Harmonia Mundi HMU 907313. O’Dette, Paul, 2006. Daniel Bacheler: The Bachelar’s Delight: Lute Music. Harmonia Mundi HMU 907389. O’Dette, Paul, 2007. Johann Sebastian Bach: Lute Works, Volume 1. Harmonia Mundi HMU 907438. O’Dette, Paul, 2008. Melchior Neusidler: Lute Music. Harmonia Mundi HMU 907388. O’Dette, Paul, 2010. Marco dall’Aquila: Pieces for lute. Harmonia Mundi HMU 907548. O’Dette, Paul, 2013. Francesco da Milano “Il divino”. Harmonia Mundi HMU 907557. Sayce, Linda, 1992. The Golden Age Restor’d: Lute Music by John & Robert Johnson. Dervorguilla Ltd DRVCD101. Smith, Hopkinson (vihuela), 1986/1989. Luys Milan: El Maestro Tome I. Música de vihuela de mano. Auvidis-Astrée E 7748. Smith, Hopkinson (vihuela), 1989. Luys de Narvaez: Los seys líbros del Delphín de música. Auvidis-Astrée E 8706. Smith, Hopkinson, 1988. Piéces de Luth du Vieux Gaultier. Auvidis-Astrée E 8703. Smith, Hopkinson, 1990. Sylvius Leopold Weiss: Pieces de Luth. Auvidis-Astrée E 8718. Smith, Hopkinson, 1993. Jean-Sébastien Bach: Suites BWV 1010 & BWV 1012 pour luth baroque. Auvidis France E 8744. Smith, Hopkinson, 1994. Jacques de Gallot: Piéces de Luth. Auvidis France E 8528. Smith, Hopkinson, 1995. Giovanni Girolamo Kapsberger: Libro Primo d’Intavolatura di Lauto. Auvidis France E 8553. Smith, Hopkinson, 1998. Sylvius Leopold Weiss: Partitas pour Luth. Auvidis France E 8620. Smith, Hopkinson, 1999-2000. Bach: Sonatas & Partitas. Naïve E 8678. Smith, Hopkinson, 2001 & 2002. Pierre Attaingnant: Préludes, Chansons & Dances pour Luth. Naïve E 8854. Smith, Hopkinson, 2008. Francesco da Milano: fantasias/ricercari, intabulations, dances and reconstructions. Naïve E 8921. Stone, Richard, 1993. Lute Works of Silvius Leopold Weiss from the Dresden MSS. Titanic Records Ti-213. Stubbs, Stephen, 1995. Jacques de Saint-Luc: Pièces pour luth. Musique en Wallonie CYP 3605. Stubbs, Stephen, 2003. J.S. Bach: Lute Works. ATMA ACD 2 2238. Wadsworth, Matthew, 2006 (lute & theorbo). Masters of the Lute. Channel Classics CCS SA 24206. Wadsworth, Matthew, 2009. The Knight of the Lute: Music from The Varietie of Lute Lessons 1610. Channel Classics CCS SA 25408. Wilson, Christopher (solo lute); Rumsey, Shirley (lute duettist), 1994. Francesco Canova da Milano: Fantasias, Ricercars and Duets. Naxos 8.550774. Wilson, Christopher (vihuela), 1996. Milán & Narváez: Music for Vilhuela. Naxos 8.553523. Wilson, Christopher, 1996. dall’Aquila & da Crema: Lute Music: Ricercars, Intabulations, Dances. Naxos 8.550778. Wilson, Christopher (solo lute); Rumsey, Shirley (lute duettist), 1999. *Early Venetian Lute Music. Naxos 8.553694. Wilson, Christopher (solo lute); Rumsey, Shirley (lute duettist), 2003. John Johnson: Lute Music. Naxos 8.550776. Ysrael, Miguel, 2010. The Court of Bayreuth: Lute Music of Hagen and Falckenhagen. Brilliant Classics 94026. Lindberg, Jakob; Meunier, Robert; North, Nigel & O’Dette, Paul, etc., 1985/1986. “Three, Four and Twenty Lutes”. BIS-CD-341. Quartetto di Liuti da Milano, 2014. Emilio Bezzi, Renato Cadel, Elisa La Marca, & Giulia La Marca. Vita de la Mia Vita: Ricerares, Dances, Madrigals, and Villanellas on Four Lutes. Brilliant Classics 95038. Venere Lute Quartet, 2006. Gail Gillespie, Douglas Freundlich, Christopher Morrongiello, Philip Rukavina. Palestrina’s Lute. Lute Society of America. Venere Lute Quartet, 2017. Gail Gillespie, Douglas Freundlich, Christopher Morrongiello, Philip Rukavina. Ornythology: Byrd and Friends. Gamut Music GM04. Baird, Julianne, soprano; McFarlane, Ronn, lute, 1988. The English Lute Song. Dorian Recordings DOR-90109. Baird, Julianne, soprano; McFarlane, Ronn, lute, 1989. Greensleeves: A Collection of English Lute Songs. Dorian Recordings DOR-90126. Baird, Julianne, soprano; McFarlane, Ronn, lute, 1996. The Italian Lute Song. Dorian Recordings DOR-90236. The Boston Camerata, Joel Cohen, director, lute and cittern, 1998. Anne Azéma, soprano; Noel Bisson, soprano; Karen Clark, mezzo-soprano; William Hite, tenor; Joel Frederiksen, bass and lute; Jesse Lepkoff, flute and recorder; Robert Mealy, violin; Card Lewis, treble and bass viol; Lynn Telenbaum, tenor viol; Emily Walhout, bass viol; Olav Chris Henriksen, lute and guitar. What Then Is Love? An Elizabethan Songbook. Erato Disques 3984-23417-2. Covey-Crump, Rogers, tenor; Lindberg, Jakob, lute, 1988 & 1990. John Dowland: The First Booke of Songs. BIS CD-430. Davidson, Grace, soprano; Miller, David, lute, 2018. John Dowland: First Booke of Songes or Ayres. Signum Classic SIGCD553. DeGaetani, Jan, mezzo-soprano; O’Dette, Paul, lute; Thielmann, Christel, bass viol and lyra viol, 1984. Elizabethan Love Songs and Ayres to the Lute and Viol. Pantheon D07132. Hummel, Martin, baritone; Schröder, Karl-Ernst, lute, 2002. Eternal Love: 17th Century German Lute Songs. Naxos 8.555935. Hillier, Paul, voice; North, Nigel, lute, 2002. The Rags of Time: 17th-c. English lute songs and dances. Harmonia Mundi HMU 907257. Kirkby, Emma, soprano; Thomas, David, bass; Rooley, Anthony, lute, 1982. Henry Purcell: Songs and Dialogues. Hyperion CDA66056. Kirkby, Emma, soprano; Rooley, Anthony, lute, 1986. Time Stands Still: Lute songs on the theme of mutability and metamorphosis by John Dowland and his contemporaries. Hyperion CDA66186. Minter, Drew, counter tenor; O’Dette, Paul, lute, 1990. Thomas Campion: Ayres. Harmonia Mundi HMU 907023. The Robert DeCormier Singers, Robert DeCormier, director; Julianne Baird, soprano; David Tayler, lute, 1991. Awake, Sweet Love / The Music of John Dowland. Arabesque Recordings Z6622. Short, Nigel, countertenor; Miller, David, lute, 1995. Libby Crabtree, soprano; Charlie Daniels, Matthew Vine, tenors; Adrian Peacock, bass; Jacob Heringman, lute; Mark Caudle, bass viol. John Danyel: The Complete Songs and Lute Music. Hyperion CDA66714. Sting, vocals & archlute; Karamazov, Edin, lute & archlute, 2006. Songs from the Labyrinth: Music by John Dowland. Deutsche Grammophon / Universal B0007220-02. Urrey, Frederick, tenor; McFarlane, Ronn, lute, 1990. O Mistress Mine: A Collection of English Lute Songs. Dorian Recordings DOR-90136. The Baltimore Consort, 1990. Mary Anne Ballard, treble viol, fiddle, bass viol, tenor viol; Howard Bass, bandora; Mark Cudek, cittern, bass viol; Edwin George, bagpipe, recorder; Alice Kosloski, alto; Custer LaRue, soprano; Larry Lipkis, bass viol, tenor viol; Ronn McFarlane, lute; Chris Norman, renaissance flutes. On the Banks of Helicon: Early Music of Scotland. Dorian Recordings DOR-90139. The Baltimore Consort, 1991. Mary Anne Ballard, treble viol, tenor viol; Mark Cudek, cittern, bass viol; Custer LaRue, soprano; Larry Lipkis, tenor viol, bass viol; Ronn McFarlane, lute; Chris Norman, wooden flutes; Webb Wiggins, virginal, muselar. Guest artists: Howard Bass, bandora, lute; Ann Marie Morgan, bass viol. Watkins Ale: Music of the English Renaissance. Dorian Recordings DOR-90142. The Baltimore Consort and The Merry Companions, 1992. Mary Anne Ballard, treble and bass viols, fiddle; Mark Cudek, cittern, renaissance guitar, tenor recorder, belch-canto; Custer LaRue, soprano; Larry Lipkis, recorders, bass viol; Ronn McFarlane, lutes; Chris Norman, wooden flutes, pennywhistle; Webb Wiggins, virginal (?! ), tambourine. Guest artist: Lorenzo Labbrobacio, fartophone. The Merry Companions: Peter Becker, baritone; Alexander Blachly, baritone; Paul Shipper, bass, belch-canto; James Weaver, baritone. The Art of the Bawdy Song. Dorian Recordings DOR-90155. The Baltimore Consort, 1993. Mary Anne Ballard, viols, rebec; Mark Cudek, cittern, renaissance guitar, viol, crumhorns, recorder, lute; Custer LaRue, soprano; Larry Lipkis, viols, recorders, crumhorns; Ronn McFarlane, lutes; Chris Norman, flutes, bagpipe, crumhorn, drum. La Rocque’n’Roll: Popular Music of Renaissance France. Dorian Recordings DOR-90177. The Baltimore Consort, 1994. Mary Anne Ballard, viols and rebec; Mark Cudek, cittern, Baroque guitar, viol, bandora; Custer LaRue, soprano; Larry Lipkis, viol, recorder and gemshorn; Ronn McFarlane, lutes; Chris Norman, wooden flutes and pennywhistle; Webb Wiggins, organ. Bright Day Star: Music for the Yuletide Season. Dorian Recordings DOR-90198. The Baltimore Consort, 1996. Mary Anne Ballard, treble and bass viols, rebec; Mark Cudek, cittern, Baroque guitar, tenor viol, tenor recorder; Custer LaRue, soprano; Larry Lipkis, viol, soprano recorder; Ronn McFarlane, lute; Chris Norman, wooden flutes, bagpipe. A Trip to Killburn: Playford Tunes and their Ballads. Dorian Recordings DOR-90238. Blanchard, Carver, 1992. Carver Blanchard, lute and voice; Nel Moore, harmonica; Glen Saunders, string bass; Jim Cowdery, recorder. Lute Unleashed. Albany Records Troy 083. Douglass, David, violin; O’Dette, Paul, theorbo; Lawrence-King, Andrew, harps, 1998. Apollo’s Banquet: 17th Century Music from the Publications of John Playford. Harmonia Mundi HMU 907186. The Dowland Consort directed by Jakob Lindberg, lute; Wendy Gillespie, treble and alto viols; Alison Crum, tenor and alto viols; Sarah Cunningham, small bass and tenor viols; Richard Campbell, consort bass viol; Trevor Jones, great bass viol, 1983 & 1986. John Dowland: Lachrimae, or Seaven Teares. BIS-CD-315. The Dowland Consort directed by Jakob Lindberg, lute, 1989/90, 1991. Wendy Gillespie, treble and alto viols; Sarah Cunningham, tenor and alto viols; Sarah Groser, small bass and tenor viols; Richard Campbell, consort bass viol; Alison Crum, great bass viol. Anthony Holborne: Pavans, Galliards, Almains and other pieces. BIS-CD-469. LaRue, Custer with The Baltimore Consort, 1993. Custer LaRue, soprano; Ronn McFarlane, lute; Mark Cudek, cittern, Baroque guitar, plucked bass viol; Chris Norman, wooden flute, cauld wind pipes, drum; Mary Anne Ballard, treble viol, bass viol; Larry Lipkis, bass viol, gemshorn. Custer LaRue sings The Daemon Lover: Traditional Ballads & Songs of England, Scotland & America. Dorian Recordings DOR-90174. Lislevand, Rolf, theorbo and colascione, 1993. Eduardo Eguez, chitarra battente, baroque guitar; Brian Feehan, chitarrone, colascione; Guido Morini, organ, harpsichord; Lorentz Duftschmid, violone; Pedro Estevan, percussion. Kapsberger: Libro Quarto D’intavolatura di Chitarone (Roma 1640). Auvidis-Astrée E 8515. Lislevand, Rolf, lutes, vihuela de mano, 2009. Linn Andrea Fuglseth, voice; Anna Maria Friman, voice; Giovanni Pessi, triple harp; Marco Ambrosini, nyckelharpa; Thor-Harald Johnsen, chitarra battente, vihuela demano, lutes; Michael Behringer, clavichord, organ; Bjørn Kjellemyr, colascione; David Mayoral, percussion. Diminuito. ECM Records ECM 2008. McFarlane, Ronn, lute, 2007. James Blachly, bass; Mindy Rosenfield, flute and harp; Danny Mallon, percussion; Mark Cudek, cittern; Bela Nachtigall, harmonium; Rowell Jao, first violin; Erin Freund, second violin; Jason Diggs, viola; April Angilletta, cello. Indigo Road: Original Lute Music. Sono Luminus DSL-90701. Roberts, Timothy, organ, 1995. Jacob Heringman and David Miller, lute and theorbo; Rose Consort of Viols. William Lawes: Consort Music for Viols, Lutes and Theorbos. Naxos 8.550601. Schneiderman, John, lute, 2009. Elizabeth Blumenstock, violin; William Skeen, violoncello. Bernhard Joachim Hagen: Sonatas for Lute & Strings. Dorian/Sono Luminous DSL-90907.